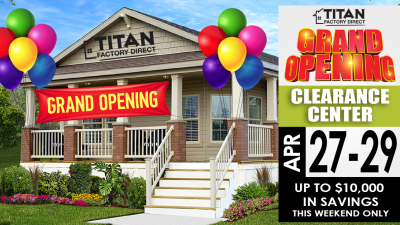 San Antonio, TX., April 25, 2018 –Titan Factory Direct, a factory direct builder of Champion Homes, is excited to announce the grand opening of their new clearance home sales center in San Antonio, TX. The new Clearance Center is a much-anticipated response in support of local families struggling to find affordable housing amidst rising real estate prices. The celebration will begin with a ribbon cutting ceremony on Thursday April 26th with celebrations continuing through Sunday April 29th. Prospective homebuyers will be able to tour several beautiful new model homes and meet with onsite factory representatives and lenders available to answer any questions. The focus this weekend is to both celebrate and educate new homebuyers in the purchasing process and the options that are available to them. Lenders and factory representatives will be onsite and available to answer questions. All weekend guests will be able to enjoy special grand opening pricing, delicious food, music, giveaways and raffle prizes. KJ97’s Randy Carroll will be broadcasting live from the Clearance Center all day Saturday. The San Antonio Clearance Center marks the twelfth sales location for the company, and the third in the greater San Antonio area. Titan Factory Direct helps homebuyers with finding more affordable housing solutions and assists with every step of the process until they’re ready for move-in, offering full turnkey services. “We’ve had a great response from the local community during our preview opening phase,” says Philip Turturro, General Manager for Titan Factory Direct of San Antonio. “This is a rapidly growing market and this new location will help us better serve our customers’ needs.” The Clearance Center is focused on helping San Antonio homebuyers and low-income families to find affordable housing in a growing market with rising home prices. Titan Factory Direct San Antonio Clearance Center offers a wide selection of award-winning manufactured and modular new home floorplans. To RSVP for the grand opening or to schedule a VIP appointment with a professional housing consultant, call 855-550-6550 or visit www.titanfactorydirect.com. About Titan Factory Direct A factory direct builder of Champion Homes, Titan Factory Direct is a full service manufactured and modular homes company. Titan will help with home site selection and assists in all phases of purchasing and building, from start to finish. Their wide selection allows buyers to search for new and used manufactured, modular and mobile homes for sale as well as repossessions, land-home packages, commercial and oil field housing for the best price available. For more information, visit www.titanfactorydirect.com. Read the latest news from Titan Factory Direct. Share and Earn. 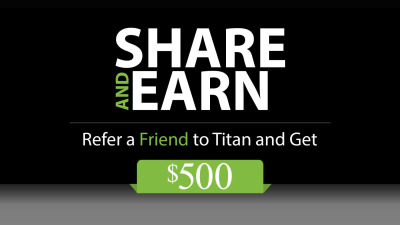 Refer a friend or family to Titan Factory Direct and receive $500!